MOSCOW, August 14. /TASS/. In the first half of 2017, the average life expectancy in Russia reached 72.4 years, Deputy Prime Minister for Social Affairs Olga Golodets told reporters on Monday. 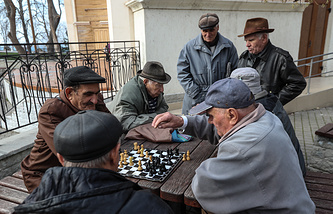 "The average life expectancy in Russia has exceeded 72 years for the first time," she said adding that Russia’s Statistical Agency Rosstat expected the average life expectancy to reach 72.4 years in the first half of 2017. "In comparison with 2016, the average life expectancy in Russia has grown by six months," Golodets pointed out. According to the deputy prime minister, consistent work aimed at decreasing the mortality rate was the key factor providing for life expectancy growth. She noted that in the first half of 2017, the mortality rate had decreased to 12.9 per 1,000 people compared to 13.2 in the same period of 2016. "Issues concerning health and demography are the government’s priority," Golodets stressed. "The cabinet will remain focused on them in the future," she added.